I should hate this. Easy listening covers of hard rock songs. Hard rock covers of dance songs. Dance covers of jazz standards. Urrgh. Any sense of joy and discovery and emotional connection gets flattened by the concept, by the unspoken attitude behind the project, which is always one of three mindsets: Look how good this music would be if it adhered to our aesthetic norms (the impulse behind Travis’s Britney cover and Alien Ant Farm’s Smooth Criminal); Look how clever I am, that I can take a song in that style and play it in this style (the impulse behind this); or Look at me and my funny arrangements of pop songs (Richard Cheese and so on). 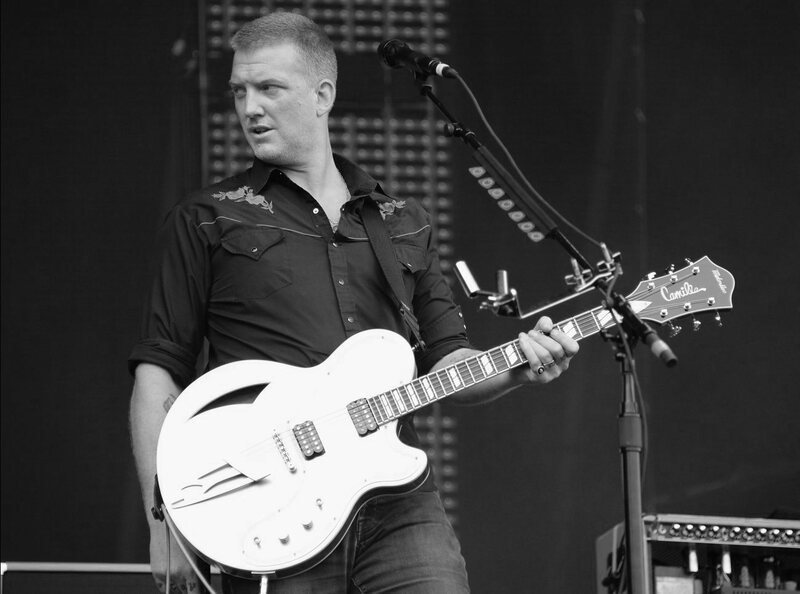 When the Queens of the Stone Age started, they derived their effect from playing repetitive riffs at punishing volume (and I do mean punishing – no other gig I’ve seen has come close to the eardrum-shattering, stomach-churning volume of QOTSA back in 2001, although I’ve never seen MBV or Dinosaur Jr), creating a sort of heavy metal version of Kraftwerk – robot rock, as Josh Homme called it. But even by the time of second album Rated R, they were moving away from that. It became clear to Homme, I think, that the band’s real power lay in the distance between the aggression of the music and his calm, clean, disconnected-sounding vocals. Homme doesn’t shout hoarsely and passionately. He sings calmly, in rather a high-pitched voice, while the band around him batter their instruments senseless. That tension lies at the heart of all their great early songs: Regular John, Mexicola, The Lost Art of Keeping a Secret, Better Living Through Chemistry, In the Fade (although Lanegan is Homme’s proxy on that one) and No One Knows. During Nick Oliveri’s time with the band, his gonzo vocal performances were effective because of their contrast with Homme’s reigned-in style; without Homme’s blankness to play off, they’d have simply been ludicrous (and as it is they’re still pretty silly). There’s no need to remake a QOTSA record where the music sounds as disconnected, as lifeless, as the vocal. Or, if you are going to make elevator-music backing tracks, get powerful, sweaty voices to sing the songs. Get, I don’t know, Tina Turner or someone, to stamp and bellow her way through them. Get Tom Jones to come over and roar the songs like an enraged Old Testament prophet. And yet… I like this. I shouldn’t. On paper it shouldn’t work. I shouldn’t just dislike it; I should hate it. This sort of thing never works as real music. And yet it, on this occasion, it does. Olivier Libaux, the French songwriter behind Les Objets Bain and Nouvelle Vague (who have done the same in the past to the Talking Heads), has made a full record of this stuff, with a parade of guest singers: the Bird & the Bee singer Inara George (daughter of Lowell George from Little Feat) on No One Knows, plus Susan Dillane from Woodbine, Ambrosia Parsley from Shivaree, Skye from Morcheeba and so on. Since all the singers give similar performances, with no real outliers in tone or approach, there’s more than a whiff of markets being targeted; get a guest singer and you can sell your record to that singer’s fanbase; get 10 guest singers… There’s more than a whiff of cynicism about the whole enterprise, and still I can’t bring myself to hate the damn thing. It’s a strange feeling to like a record that seems to have been designed specifically to annoy you. Yet here it is, and while I’m certain I couldn’t stand a whole album of it, I do like it. I’d tell you why, but I honestly can’t. This entry was posted in Music and tagged Alien Ant Farm, Ambrosia Parsley, Dinosaur Jr, Inara George, Morcheeba, My Bloody Valentine, Nick Oliveri, No One Knows, Olivier Libaux, Queens of the Stone Age, Rated R, Richard Cheese, Shivaree, Skye, Songs for the Deaf, Susan Dillane, The Bird & the Bee, Tina Turner, Tom Jones, Travis, Woodbine on October 4, 2013 by rossjpalmer.